We generate and study dense positionally and/or orientationally disordered, including jammed, monodisperse packings of hard convex lens-shaped particles (lenses). Relatively dense isotropic fluid configurations of lenses of various aspect ratios are slowly compressed via a Monte Carlo method based procedure. Under this compression protocol, while ‘flat’ lenses form a nematic fluid phase (where particles are positionally disordered but orientationally ordered) and ‘globular’ lenses form a plastic solid phase (where particles are positionally ordered but orientationally disordered), ‘intermediate’, neither ‘flat’ nor ‘globular’, lenses do not form either mesophase. In general, a crystal solid phase (where particles are both positionally and orientationally ordered) does not spontaneously form during lengthy numerical simulation runs. In correspondence to those volume fractions at which a transition to the crystal solid phase would occur in equilibrium, a ‘downturn’ is observed in the inverse compressibility factor versus volume fraction curve beyond which this curve behaves essentially linearly. 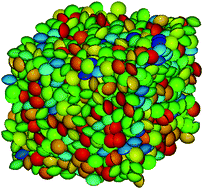 This allows us to estimate the volume fraction at jamming of the dense non-crystalline packings so generated. These packings are nematic for ‘flat’ lenses and plastic for ‘globular’ lenses, while they are robustly isotropic for ‘intermediate’ lenses, as confirmed by the calculation of the τ order metric, among other quantities. The structure factors S(k) of the corresponding jammed states tend to zero as the wavenumber k goes to zero, indicating they are effectively hyperuniform (i.e., their infinite-wavelength density fluctuations are anomalously suppressed). Among all possible lens shapes, ‘intermediate’ lenses with aspect ratio around 2/3 are special because they are those that reach the highest volume fractions at jamming while being positionally and orientationally disordered and these volume fractions are as high as those reached by nematic jammed states of ‘flat’ lenses and plastic jammed states of ‘globular’ lenses. All of their attributes, taken together, make such ‘intermediate’ lens packings particularly good glass-forming materials.